During 1876 the Carlton Football Club moved from Royal Park to the Roman Catholic Reserve in Madelaine Street (now the site of Newman College). This was made possible by a deal struck between the Carlton administration and the University council for Carlton to use the reserve. In return for capital works on the ground the Carlton Football Club could charge admission to pay for the capital works and donate any surplus to charity. The club spent £250 levelling, grassing and fencing off a ground approximately 200 by 150 yards. This would be the first time that the club had an enclosed ground where crowd behaviour could be better controlled and admission charged in a controlled manner. Despite the existance of the new ground, during the 1876 season most home games were still played at Royal Park. This season saw the retirement of players such as Harry Guy, Jack Donovan , Wallace , John Blanchard , Monie , Lacey and McGibbon. Fortunately one of the replacements to debut this season was George Coulthard who would go on to be a magnificent player. A. McMicheal and Joe H. Henry were promoted from the Imperials and the brothers W. 'Billy' Bracken and Loch J. Bracken and J.C.Mathieson were recruited from West Melbourne. Carlton's long association with Bendigo began in 1876 with the first ever trip by the club to Sandhurst as it was known then. The Blues won convincingly against the locals 7 goals to nil. At the end of the season Carlton had played 20 games, won 15, lost 2 and drew 3. In total Carlton kicked 54 goals (a record to that point) and had only 12 goals kicked against. Second Twenty Sec: F. Williams. Honours: Champion of the Colony. George Coulthard. Champion of the Colony: Goal Kicking. William Dedman 18 goals. Games played: 20. Won 15 Lost 2 Drew 3. Goals: For 54 Against 12. Won Champion of Colony in his first year. A star of the 1870's. One of Carlton's greats, this was the first of 3 such awards for Coulthard. Carlton were unable to obtain trustee approval to fence the Royal Park ground. The club could not prevent the crowds from spilling onto the playing arena, and disrupting games. After the benefit match of 1875 at University, the club made negotiations to play it's home games there at the Madeline Street ground, now Newman College. The club spent 250 pounds ($500.00) on preparations, levelling, rolling, and building a picket fence around the playing area. A galvanised iron fence was erected to enclose the ground. Carlton's first game against Melbourne on June 10 at Royal Park resulted in the Blues winning 3-0. A spiteful July game against Carlton Imperial was played. The Imps. were upset at losing their top players to the Blues George Coulthard , A. McMichael and Joe H. Henry; and set out to prove they were still a side to be reckoned with. "That it is undesirable in the interests of the game that the engagements with the Carlton Imperials for the current season be carried out. They are, therefore, hereby cancelled." 10,000 at the Melboune ground saw the Reds defeat the Blues 2-1. A 2-1win against a Hawthorn 25 man side on July 15th., was followed with a 4-1 win at Geelong a week later. August 19th. Carlton played it's first game on it's new ground against Melbourne a 2-2 draw. Melbourne won the Challenge Cup for 1876 when they defeated Carlton with the last kick of the day when J.M. MacDonald place kicked the goal to give them victory. Albert Park merged with North Melbourne this year. 1876. Premiers.Melbourne. 2. Carlton. 3. Albert Park. May 24 vs Bendigo at Sandhurst. May 27 vs South Melbourne at Royal Park. June 03 vs Albert Park-North Melbourne at Royal Park. June 10 vs Melbourne at Royal Park. June 17 vs East Melbourne at Royal Park. June 24 vs Victorian Railways at Royal Park. July 01 vs Carlton Imperial at University Paddock. July 08 vs Melbourne at Melbourne. July 15 vs Hawthorn (20 to 25) at Hawthorn. July 22 vs Geelong at Geelong. July 29 vs St.Kilda at St.Kilda. Aug. 05 vs East Melbourne at Royal Park. Aug. 12 vs Albert Park-North Melbourne at Albert Park. Aug. 26 vs Western District Combined at Pic-nic Reserve. Sept. 02 vs St.Kilda at Pic-nic Reserve. Sept. 09 vs West Melbourne (20 to 23) at Pic-nic Reserve. Sept. 16 vs Barwon at Pic-nic Reserve. Sept. 23 vs Melbourne at Pic-nic Reserve. Sept. 30 vs Victorian Railways at Royal Park. May 27 vs Brunswick at Brunswick. June 03 vs East Melbourne at Carlton. June 17 vs Albert Park Second at Carlton. June 24 vs Carlton Imperial Second at University. July 01 vs Kilmore at Kilmore. July 15 vs St.Kilda Second at St.Kilda. July 22 vs Geelong Imperial at Geelong. July 27 vs Melbourne Second at Melbourne. Aug. 05 vs North Melbourne Second. Aug. 26 vs Albert Park Second. September 2 Carlton Imperial at Carlton. September 9 St.Kilda at Carlton. September 16 Albion Union (25) at Carlton. September 23 Dandenong at Dandenong. September 30 Melbourne Second at Carlton. October 7 North Melbourne Second at Carlton. October 14 Victoria Parade at Carlton. "Carlton, as confident as ever, sees the palm of victory waiting to be plucked, though the retirement of men like Lacey, Guy, Donovan, Monie, Wallace, Blanshard, and M'Gibbon must cause a gap difficult to fill. McMichael, Henry, and Coulthard, of Carlton Imperial fame; Mathieson, of West Melbourne; and the two Brackens are, however, waiting to step into the breach, and time will show whether her confidence is well grounded." The Footballer was the brain child of Tom Power and the annual ran for 7 years. The picture of the footballer was drawn by Carlton footballer Angelo J. Azzopardi he was an artist and an engraver and he had a laneway named after him in Melbourne. See his bio page. The name Azzoppardi appears near the heel of the footballer. Carlton F. C. Sports Day at the University ground at the rear of the University. Due to the weather, the Sports Day was postponed to next Saturday April 8. Mr. R. Robertson the Carlton President occupied the chair. "The report showed the club to have passed another year of marked to success, and congratulated the first twenty on their upholding the position as premiers." Club members numbered 190, and the balance sheet was considered satisfactory. Goal Scorers; Dedman13, McGill 7, Nudd 6, Newing 5, Lacey 2, Dalton 1, Blanchard 1, S. Wallace 1. Played 11 Won 3 Lost 7 Drawn 1. The coming season looks promising for the second twenty with considerable interest shown by it's supporters. The balance sheet, Receipts £86 6s 2d. Expenditure £80 6s 9d. Leaving a balance of £5 13s 5d. Patrons; Messrs. G. S. Coppin, J. Curtain, J. Walls, T. C. Russell, Dr. J. C. Duncan. Vice presidents; Messrs. E. Latham, J. H. Guy, J. Donovan. Second Twenty Secretary; F. Williams. Second Twenty Captain; J. S. Dismorr. Committee; Messrs. A. McHarg, H. F. Boyle, W. Lacey, H. Nudd, W. Dedman, A. Kennedy, J. McGibbon, W. Newing, W. Williams. Votes of thanks were recorded to Messrs. R. Robertson, J. H. Guy, and Power for the interest displayed by them on behalf of the club. Mr. Guy received a special vote, on the announcement of his retiring from the field, after a long and faithful service of 11 years. Gold lockets were presented to Messrs. McGill, Gardiner, Goer, and Kendall, and the meeting adjourned to Tuesday evening next, 11th. April, when the prizes won at the sports Saturday 8th, will be presented, together with addresses to Messrs. Dedman and Dismorr. Main entrance off Madeline Street, cabs ran from Swanston Street every 5 minutes. Special programme printed and races started at 2pm. Leydin's Carlton Private Band provided the musical entertainment. The programme was running late and several events were postponed until April 29. 100 yard Handicap Flat Race; open handicap. Winning Time; 10.75 seconds Won by 2 feet. 150 yard Handicap Flat Race; for playing members. J. H. Guy and W. Monie were favourites for this race, but could not cope with the heavy track. 1. C. Monie 34 seconds (off 9 yds), 2. A. McMichael (off 12 yds), 3. J. Macgibbon 12 yards. Monie won by 1 yard. 1. Harry Bannister 15 yards, 2. W. Guy 12 yards, 3. T. McFarlane 12 yards. 1. W. Newing 35 yards, 2. W. Monie 10 yards. Drop Kick open to all Challenge Cup clubs. 1. W. Hall, Geelong, 68 yards. 2. James Rickards, Carlton Imperial 60 yards 1ft 6ins. 3. J. Macdonald, University 59 yard 2 ft. 4. G. McGill, Carlton 59 yards 1 ft 6ins. St.Kilda, University, Albert Park, Melbourne, East Melbourne, North Melbourne, Carlton Imperial, Carlton, Corio (Geelong), and Barwon (Geelong). Carlton representatives; McGill, Nudd, Donovan. 1. H. Nudd 60 yards, 2. G. McGill 59 yards. A meeting was held at the Carlton Club Hotel where the various prizes won last Saturday were presented. Carlton played a scratch match at Royal Park, kick-off at 3pm. Teams selected by Gardiner and McGill. CARLTON SPORTS DAY - Supplementary races held at the University ground. 1. A. McMichael (3 yards), 2. C. Monie (scratch). An amusing start as the official starter broke the pistol and had to yell "off" to begin the race. Eight started with Bracken the favorite. Robin kicked the longest but was disqualified. Four couples were buckled up for this event, the most amusing being Donovan and Val Robertson, who did not get along kindly at all. Delegates from the various clubs held a meeting at Nissen's Cafe last Saturday to organise a Second Twenty Challenge Cup. Carlton's delegate was Mr. Williams. Carlton played a President's vs Vice president's match at Royal Park. Amess, Amess, Bannister, Bracken, Bracken, Bell, Brookes, Coulthard, A. Dismoor, Deeley, Duckett, Gardiner, Gardiner, Goer, Henry, Kendall, T. Kennedy, Knowles, Lacey, McGibbon, Nathan, Newing, Robin, J. Robertson, Turnbull, W. Williams, Williamson. Amess, Blanchard, T. Crockett, Dalton, Dedman, Goodall, Hillsden, Hipe, A. Kennedy, Long, Monie, Monie, Muir, Matheson, McGill, McMichael, Nudd, O'Brien, Patterson, F. Power, V. Robertson, G. Robertson, Spencer, Toohey, Vale, F. Williams. A meeting of delegates at Nissen's Cafe for the Second Twenty Cup. Clubs attending were Carlton, Melbourne, Albert Park, East Melbourne, North Melbourne, and Carlton Imperial. The trophy is valued at £8 and will be subscribed for. "A meeting of the Second Twenty Subscription Cup committee was held at Nissan's Cafe on Saturday evening. The following clubs were represented; Carlton, Melbourne, Albert Park, East Melbourne, North Melbourne, and Carlton Imperial. It was resolved that a cup, value £8 be subscribed for, the last day for other senior clubs to join to be Saturday next. That the first twenty secretaries to be the arbitrators in case of a dispute; that central and goal umpires to approved of by both sides before they act in any match. Final arrangements will be made at Nissen's Cafe, at eight o'clock Saturday next." Carlton's F. Williams was elected the secretary & treasurer. "Rumour will have it that the Carlton, Melbourne, and Carlton Imperial will refuse to meet them, their rowdyism, which is so extant, having gained for them a name of notoriety. This is all the more to be regretted as the members themselves are respectable enough, with one or two exceptions, and, with a little weeding, all discontent and strife would banish." Carlton played a Captains' vs Vice Captains' match at Royal Park. Amess, Amess, Bannister, Blanchard, Brooks, Brasher, J. Carr, Cavanagh, Dalton, Dedman, Dismorr, Donovan, Gardiner (Capt. ), Hillsden, Hipe, A. Kennedy, T. Kennedy, Kendall, Lanyon, N. Monie, Nathan, Newing, Nudd, O'Brien, G. Robertson, J. Robertson, V. Robertson, Spencer, Vale, F. Williams, Williamson. R. Amess, Bracken, Bell, Coulthard, Crocket, Deeley, Duckett, Gardiner, Goer, Goodall, Henry, Knowles, Lacey, Long, Matheson, Monie, Monie, Muir, McGill (Vice capt. ), McHarg, McMichael, Opie, Pattison, T. Power, F. Power, Edward 'Ted' Prevot, Robin, Toohey, Turnbull, Wallace. "The old players, Messrs. Gardiner, McGill, Nudd, and others have not lot any of the agility they displayed last season." Matheson is from West Melbourne. "A meeting of the Second Twenty Subscription Cup committee was held at Nissen's Cafe on Saturday evening, where the following clubs were entered for the Cup:- Carlton, Melbourne, Albert Park, St. Kilda, East Melbourne, North Melbourne, and Carlton Imperial. It was agreed that the subscription be £1 10s each club, and the cost of the trophy, which will be a handsome one, £8, the balance to provide for printing and other expenses. The committee elected Mr. F. Williams, of the Carlton, as their secretary and treasurer, adopted rules and arranged for matches during the season. Copies of the rules, together with the lists of engagements, will be published immediately. It was suggested that the secretaries of the clubs would greatly facilitate business in a crowded room by attaching slips of paper bearing the names of their respective clubs to the wall above their tables." A Carlton team played against all comers. The committee will meet in the evening to select the team to play Bendigo on Wednesday. "The Carlton first twenty made arrangements to meet all-comers on their own ground, which resulted in favour of the former. At the same time an opportunity was afforded of testing the skill and ability of the new players who are candidates for the vacancies caused by the retirements of Messrs. Lacey, Guy, Wallace, and Blanchard. Amongst those whose names are worthy of mention, will be found that of Prevot, who, I believe, is an old Hawthorn identity. Judging from his play up to the present, he will be found an acquisition to the team. Coulthard will also be found a very useful man, and McMichael and Henry will also occupy positions. Matheson, late of the West Melbourne, showed no energy whatever in his play; even when afforded an opening for plying his abilities, it resulted in failure, great fault being found that he held the ball rather long. So far as that goes, I think with a slight hint that he is defective in that respect, he would soon give it over; otherwise his play is very good. The Australasian reports that the University team is now defunct. Also Geelong has now "adopted a new uniform, consisting of dark blue and white striped hose and cap, and blue knickerbockers. This has set her at loggerheads with the Barwon, which has elected to don these colours, and had to change them so as to be qualified to play for the Western District Challenge Cup a handsome trophy presented by Mr. T. W. Wills, which has to be held two consectutive years against all comers." The point of interest here for Carlton is, that the Blues adopted blue and white striped hose, or socks, the year before in 1875. May 24 Wednesday Queen's Birthday. Eight city clubs visited the country and provincial cities to play local teams. "..a thing unprecented in the history of football in Victoria,..."
Carlton to Bendigo, Melbourne to Ballarat, East Melbourne to play Geelong, Carlton Imperial to play Geelong Imperial, West Melbourne to play Barwon, St. Kilda seconds to play Geelong seconds, St.Kilda to Kyneton, Hawthorn to Kilmore. Other country clubs of note are; Belfast (now Port Fairy), Casterton, Coleraine, Hamilton, Koroit, Maryborough, Warrnambool. The original name for Bendigo was Sandhurst. The Sandhurst Football Club was formed June 4 1861. (The Argus, June 5 p7) The Bendigo Advertiser says the match is Bendigo vs Carlton. Carlton's first vist to Bendigo. The team gathered at Spencer Street Station at 6.45pm on Tuesday. This was the first appearance of a leading Melbourne team to the gold rush city. The Blues played Bendigo at the Kangaroo Flat Cricket Reserve, Sandhurst. There was a small attendance as the ground is about four miles from Sandhurst/Bendigo. Bendigo started the game short, and made the numbers up with substitutes as the game progressed. Several of their best players were also absent. The Blues besiged the goals in the first half but only Nudd scored a goal. Carlton played a splendid game and were loudly cheered at the conclusion. The Blues were entertained after the match at the Beehive Exchange Cafe. J. Gardiner (Capt. ), G. McGill (Vice capt. ), L. Bracken, W. Bracken, Coulthard, Dedman, Dismorr, Goer, Henry, J. Kendall, A. Kennedy, Matheson, McMichael, Murphy, Newing, Nudd, G. Robertson, J. Robertson, Turnbull, Williamson. Emerg. Knowles, A. Amess, Prevot. Goals; Dedman 3, L. Bracken 2, Nudd, Dismorr. Players mentioned; Gardiner, McGill, W. Bracken, Dedman, Henry, Newing, Nudd, L. Bracken, Coulthard, Dismorr. Carlton played a South Melbourne 25 at Royal Park. South's goal was besieged from the start and after about 30 minutes Coulthard swooped on the ball which the juniors had thought had gone out of bounds, and kicked the ball between the posts. But the goal umpire disallowed it, this incident has raised quite a deal of controversy. third, that the field umpire had no right to be so influenced by any player as to stultify his former decision by throwing the ball in from the bounds when it was fairly behind, and should have been kicked off 20 yards in front. In the second half the superior play of the senior team team became evident and the Blues had numerous shots at goal. McGill missed four close chances, Turnbull and Henry one each. L. Bracken, W. Bracken, Coulthard, Dedman, Dismorr, Gardiner (Capt.) , Goer, Henry, Kendall, A. Kennedy, McGill (Vice capt. ), McMichael, Matheson, Murphy, Newing, Nudd, G. Robertson, J. Robertson, Turnbull, Williamson. Carlton won; 2-0. The Australasian reports 1-0, only goal scorer Dedman. Players mentioned (8) Coulthard, McGill, Turnbull, Henry, Dedman, McMichael, Gardiner, Murphy. Carlton Reserves/Second Twenty played Brunswick at Brunswick. Amess, Beattie, Brookes, Bell, Bannister, A. Cooper, Crocket, Deeley, Groves, T. Kennedy, Knowles, Lanyon, Monie, Muir, Nathan, Power, Prevot, Pattison, Robin, Spencer, Todd, Toohey, Vale, F. Williams, Walters, Walters, Wheat. Football Gossip by Peter Pindar of The Australasian. "The want of grounds set apart and properly enclosed is one of the chief disabilities under which football has always laboured here. The Melbourne Club, after much solicitation, obtained permission to erect posts with movable wire to enclose their ground, and this forms the only attempt at a football ground in the metropolis, all the efforts of Carlton in that direction ending in signal failure. However, nothing daunted, I hear the latter has made overtures to the council of the University for the use of that portion of the reserve used last season by the University Athletic Club as a football ground. If the proposition be favourably entertained, the Carlton club proposes to expend about £100 in ploughing, levelling, sowing with English grass, and erecting an ornamental fence around a playing space of 200 x 150 yards, together with all other accessories necessary for the proper conduct of a game, and as by this concession the interests of football will be materially advanced, and what is now a howling wilderness be made to "rejoice and blossom as the rose." I trust the dons of the Almer Mata will not be hard-hearted. I presume a small charge for admission will be made at some of the principal matches to reimburse the club for it's outlay, but the public will not grudge this in view of the additional convenience and comfort provided." The amalgamation of the Albert Park and the North Melbourne football clubs is to take place. There will be some difficulty to harmonise the two clubs but this should result in a strong team. Carlton played Albert Park-North Melbourne at Royal Park. Earlier in the season it was reported that the Albert Park club may fold. This was hotly denied, however an alliance with North Melbourne resulted for this year. "That clear piece of land situate on the brow of the hill in Royal-park territory, called, by courtesy, the Carlton football-ground, ..."
A strong wind was blowing across the ground. Carlton were four men short, two were obtained from the Second Twenty, and Donovan came out of retirement, and the Blues played with 19 men. The red and black visitors objected to Monie playing for the Blues because they claimed he had played with Williamstown earlier in the season. He had gone to the fishing village on business and then attended a game, he had been asked to play as the locals were players short. The Carlton captain argued his case in that Monie would not be so foolish as to play for a junior club and to jeopardise his senior standing. In the end Carlton said they would not play without him, and play did not get underway until 3.40pm. The Albert Park captain did not want to play, but played under protest as he was urged on by his players. "Carlton declined to play without Monie, which, I think, showed very bad taste on their part, as they assisted to make the rules by which all clubs are guided; and when the premier club of the colony begins to transgress those rules, other clubs will begin to follow suit." "But what was the good of a protest if Carlton had won? Who would decide it? No one. This at once shows that there should be a Victorian Football Association, who should have the power to deal with all such matters, in the same way as the Cricketing Association." The Blues won the toss and decided to kick downhill, play started just before 4pm. Bracken, Bracken, Coulthard, Dedman, Dismorr, Gardiner, Goer, Henry, A. Kennedy, W. Monie, McMichael, McGill, Matheson, Newing, Nudd, Robertson, Robertson, Turnbull, Williamson. Emergencies; A. Amess, R. Amess, R. Knowles, Prevot. The game ended in a 0-0 draw when crowds invaded the playing area 5 minutes before the end. Best for Carlton; Donovan, Gardiner, McGill, Monie. Players mentioned; (14) Donovan, Gardiner, Henry, Dedman, McMichael, J. Robertson, Robertson, Goer, W. Bracken, Coulthard, Amess, Monie, McGill, Murphy. Carlton Reserves/Second Twenty played East Melbourne (17) at Royal Park. Amess, Amess, Amess, Brooks, Brooks, Beatie, Bowes, Bell, Cassells, Crocket, Deeley, Knowles, T. Kennedy, Lanyon, C. Monie, Muir, W. McGibbon, Nicholas, Prevot, Patterson, Robin, Spencer, Toohey, Todd, Voake, Vale, F. Williams, Walters, Walters, Wheat. Goals; Vail/E. Vale 2, Deely, J. Spencer, Muir. At least 10,000 again watched the Blues on a fine day for football. "- a day after a footballer's own heart was Saturday last, when Carlton met in friendly strife, her ancient rival, Melbourne, in the wide domain of Royal-park. The turf is dry and springy, yielding readily unto the eager feet that traverse it before they form two compact bodies attending their leaders orders, and quickly settle into places." doth animate the heart of every member of that gallant band, and each one feels the fame of red or honour of the blue rests in his hands." The few policemen on hand, had trouble patrolling the boundary to control the crowd. Newing, Kendall, Dedman, and Donovan did not play. Lanty O'Brien and Guy trotted out to a round of applause, to do battle for the old club. The game commenced at 3.30pm after the Blues were photographed, and Carlton kicked to the western goal. The Metropolitans had the better of the play early and missed some chances, but the Blues began to dominate just before the break. "Nearer it comes, and nearer the crowd, surging to and fro in the intense excitement of the moment." Then "Forward, Carlton!" is the cry." About half way through the second half, Nudd scored the first goal for Carlton, Melbourne became demoralised, then Nudd followed it up with another from a dubious free kick. Bracken scored the third. Crowd encroachment was again a problem late in the game. Nudd was standing to mark the ball when Bennie pushed and prevented him from doing so. An appeal was made at once for this infraction of the rules, and allowed, but meanwhile the ball had gone on and been marked by Bracken, as mentioned above." L. J. Bracken, W. Bracken, G. Coulthard, W. Dedman, J. S. Dismorr, J. Donovan, J. Gardiner (Capt. ), W. Goer, J. H. Henry, A. Hennessy, A. Kennedy, J. Kendall, J. Matheson, G. McGill (Vice capt. ), A. McMichael, W. Newing, H. Nudd, James Robertson, G. Robertson, J. Turnbull. Emerg; E. Williamson, B. Murphy, E.Prevot, R. Amess, A. Amess. Players mentioned; (19) Gardiner, Monie, McGill, Nudd, Donovan, McMichael, Henry, Mathieson, Goer, George Robertson, Guy, Lock Bracken, Coulthard, Turnbull, Lanty O'Brien, Newing, Kendall, Dedman, W. Bracken. And twice 10,000 eyes upon them fixed. A glorious setting to a noble theme. The M.C.C. proposes building a new grandstand to hold 2,000 people. This stand will be reversible, being able to face the M.C.G. for cricket and the Melbourne ground* for football. Underneath the brick building will be a skating rink, gymnasium with facilities for fencing and boxing, a skittle and bowling alley, and a racquet court. -* The Melbourne or Metropolitan football ground was adjacent to the cricket ground, on the northern side between the M.C.G. and Wellington Parade. Football was not allowed to be played on the M.C.G., however, this would soon change. The match was relocated from East Melbourne to Royal Park. "A blinding storm of rain and hail" delayed the start and the match began at 4pm allowing for only about one hours' play. The goals were set north-south to avoid the westerly wind. McMichael kicked the first goal within 10 minutes of the start. Bracken, Bracken, Coulthard, Donovan, Dismorr, Gardiner, Goer, Henry, Kennedy, Kendall, Matheson, McGill, McMichael, Monie, Newing, Nudd, Robertson, Robertson, Turnbull, Williamson. Players mentioned; (16) Murphy, McMichael, Henry, Matheson/Mathieson, Guy, Goer, Gardiner, Coulthard, Nudd, Adam Kennedy, L. Bracken, Newing, the Robertsons, Monie, MacGibbon. Carlton Reserves/Second Twenty played Albert Park Reserves for Challenge Cup at Royal Park. Amess, Amess, Brooks, Brooks, R. Knowles, T. Kennedy, C. Monie, S. Muir, W. MacGibbon, S. S. Nathan, L. O'Brien, C. Pattison (Capt. ), Prevot, P. Robin, J. Spencer, J. Toohey, H. Voke, E.Vail/Vale (Vice Capt. ), F. Williams, E. Walters, J. Wheat. Carlton were to play a combined team from the Western District. This match has been postponed to August 26 to allow the combine players to have more time to practice. Carlton played Victorian Railways 23 at Royal Park. Had the ground been dry the Blues probably would have scored four times as many goals, such was their dominance. The Railways won the toss and the Blues kicked to the western goal. Crowd encroachment was again a problem as many of them tried unsuccessfully to stop McGill from marking. McGill scored the only first half goal. McGill's marking amongst the crowd in the second half was something to remember. Bracken, Bracken, Coulthard, Crohan, Dismorr, Dedman, Donovan, Goer, Gardiner, Henry, Kendall, Kennedy, McGill, McMichael, Monie, Newing, Nudd, Robertson, Robertson, Turnbull, Williamson. Goals; McGill, J. Robertson, Newing, Nudd. Carlton Reserves played Carlton Imperial Reserves at University paddock at 3pm. July 01 Separation Day Holiday. Carlton played Carlton Imperial at the University ground. A even game but just before half time Turnbull scored the first goal, then Dedman scored another three in the remaining 15 minutes. The Imps scored the only goal in the second half. "The game throughout was very rough and spiteful, during the last 20 minutes degenerating into something more like a gladiatorial conflict than a friendly contest at football, the conduct of the Imperials being the most disgraceful and reprehensible character, and that of their partisans worse, if such could be possible. I learn since that a meeting of the Carlton was held on Tuesday evening last, at which it was unanimously resolved, 'That it is undesirable in the interests of the game that the engagements with the Carlton Imperial club for the current season be carried out; they are, therefore, hereby cancelled.' May all such conduct meet a similar fate!" Both teams started with 19 men, later the Imps added Barrass when he arrived, but the Blues continued with 19 players. W. 'Billy' Bracken, Loch J. Bracken, Dedman, Dismore, Donovan, Coulthard, Gardiner (Capt. ), Goer, Henry, A. Kennedy, McGill (Vice Capt. ), Matheson, McMichael, Newing, Nudd, J. Robertson, G. Robertson, Turnbull, Murphy, Crohan. Emergencies; R. Amos/Amess?, T. Kennedy, R. Knowles. Players mentioned; (17) Robertson, Turnbull, Goer, L. Bracken, Dedman, Nudd, Dismorr, Knowles, Matheson, McMichael, Donovan, McGill, Guy, Gardiner, Coulthard, Newing, F/W. Bracken? This match was played in the University Paddock and attracted considerable local interest, but some of the Imperialists displayed some very bad conduct towards the termination of the game, much to the surprise of all concerned, their language being principally objected to. Alexander Ford, who captained the Imperials, lost the toss for the goals, a considerable advantage, and kicked off. The ball was immediately taken down to their citadel, where the game became exciting. Waldron, jnr, Turpenny, and Reilly defended well, but the danger seemed inevitable, and after twenty minutes of play John A. Turnbull, by a fine 50 yard side kick, scored No.1 for Carlton, and not long afterwards Dedman, in quick succession scored three goals more, making in all four. After changing over, a more even game was played in the first half hour, Bracken having a chance for Carlton which hit the flag. In the last twenty minutes the Imperialists went in with vigorous rushes, and crowding their forces suddenly around the Carlton stronghold forced a goal, through the smartness of Waldron, sen, and kept up the attack with the same determination till the call of time, but leaving the old club winners by 4 goals to 1. Carlton Reserves played Kilmore at Kilmore. The team met at Spencer Street Station at 5.45 am. The ground was in good order. At 2pm, the locals won the toss and kicked with aid a slight breeze. The match was the best ever seen in Kilmore with the local team playing well. The players were entertained at the Kilmore Hotel after the match. After speeches, Blues' Captain, Pattison; "in responding, expressed the thanks of his team for the kind attention they had received, and said that with practice the Kilmore team would certainly be a formidable opponent." After more speeches and toasts "to the health of the Carlton Twenty" the Carlton players departed for Melbourne highly pleased with their days outing. H. Boyle, E or R. Brookes, W. Brookes, Bell, J. Bowes, Cassells, P. Long, J. McGibbon, W. McGibbon, C. Monie, S. Muir, N. Muir, H. Nudd, S. Nathan, L. O'Brien, C. Pattison (Capt. ), J. Rogers, P. P. Robin, J. J. Spencer, J. Sutherland, H. Todd, J. James Toohey, E. Vail (Vice Capt. ), F. Williams, E. Walters, J. Wheat. Players mentioned; (6) McGibbon, Pattison, Williams, Boyle, Spense/Spencer, L. O'Brien. Carlton general meeting at the Carlton Club Hotel. Testamonials held over from the last meeting were presented to Messrs. Dedman and Dismorr. The club's annual concert was determined upon, and other business was to be submitted to the meeting. The team met at Cavanagh's Hotel Swanston Street at 2pm. The Carlton players came onto the field wearing crepe armbands on their left arm as a mark of respect to the death of pioneer player and administrator R. Macfarland last week. "The interest in the matches between these two crack teams never seem to flag, and the greatest excitement prevailed throughout this contest, culminating in the ground being rushed, during the last few minutes, by the crowd, among which were numbers of most reputable citizens, who would be ashamed under ordinary circumstances to exhibit such emotion, evidently under the influence of ungovernable excitement." Melbourne won the toss and kicked to the eastern goal. This was the 38th. contest between these clubs since 1866, one of the fastest and best games played on the Metropolitian ground. Melbourne had only won 1 match in the last 13 played against the Blues. Amess and Knowles played, and James Roberston did not. Blanchard, L. Bracken, W. Bracken, Coulthard, Dedman, Dismorr, Donovan, Gardiner, Goer, Henry, Kendall, Kennedy, McGill, McMichael, Matheson, Murphy, Nudd, Jas. Robertson, G. Robertson, Turnbull. Emergencies; R. Amess, R. Knowles, T. Kennedy. Players mentioned; (18) Blanchard, Dedman, McGill, Kendall, Turnbull, L. Bracken, W. Bracken Goer, Gardiner, Nudd, McMichael, Donovan, Coulthard, Amess, Knowles, Henry, Matheson, G. Robertson. Carlton played Hawthorn 25 at Meaney's Paddock Hawthorn. Possibly a paddock belonging to a Mr. King below Hawthorn Gammar School in Power Street. The Weekly Times (May 20) had Carlton fixtured to play at Grace Park, Hawthorn. Carlton won the toss and kicked to the southern end. Hawthorn kicked up the hill. Bracken, Bracken, Coulthard, Dedman, Dismorr, Goer, Gardiner, Gardiner, Henry, Kennedy, McMichael, Murphy, McGill, Matheson, Nudd, Prevot, Robertson, Robertson, Turnbull. Amess, Amess, Bell, Brookes, Brookes, Knowles, Long, McGibbon, McDougall, Monie, Moore, Moore, Nathan, O'Brien, Petherick, Patterson (Capt. ), Rogers, Robin, Sutherland, Spencer, Todd, Voake/Volke?, Vale (Vice Capt. ), F. Williams, Watters/Walters, Wheat. The trustees of the Roman Catholic reserve at the rear of the University have permitted occupancy by the Carlton Football Club for it's matches. The club intends to put the ground in good order at once, construct a fence, and provide goal posts etc. The ground is expected to be ready for the next scheduled match in Melbourne. Money will be collected to cover costs, and any extra will be donated to charity. The lack of a proper football ground is one of the greatest stumbling blocks facing colonial football. Carlton played Geelong at the Argyle Ground Geelong. Geelong had a number of Reserves/Second Twenty members playing. W. Bracken, L. Bracken, Coulthard, Dalton, Donovan, Dismore, Dedman, Gardiner (Capt), Henry, Kendall, Kennedy, McGill, Matheson, McMichael, Murhpy, Newing, Nudd, J. Robertson, G. Robertson, Turnbull. Goals; L. Bracken 2, J. Henry 2, Dalton. Another report said 4-1 Dalton's goal not mentioned. Players mentioned; (16) The Robertsons, Nudd, Goer, Kennedy, the Brackens, Dalton, McMichael, Coulthard, Henry, Amess, McGibbon, Gardiner, Kendall, Oliver. Carlton Reserves played Carlton Imperial at Royal Park. Amess, Bell, Brooks, Brooks, Knowles, Long, L. O'Brien, McGibbon, Muir, Muir, Monie, S. Nathan, Pattison (Capt. ), Julius E. Petherick, P. Robin, Rogers, Sutherland, J. Spencer, Smith, Todd, E. Vale (Vice Capt. ), Williams, F. Walters, Wheat. Best; Vail, Williams, Todd, Petherick. In wet windy conditions the teams played a draw. The Blues had first use of the strong wind in the first half, but could not score. The Saints were forced to play with only 17 men up until half time. St.Kilda had the better of the play in the second, but it too found it difficult to score. "The game was very hotly contested for the first hour, neither side having any marked advantage till half time, after which the visitors warmed up and had several unsuccessful shots for goal. Nudd, the indefatigable goal-sneak of the blue-and-white team, being "off the spot," and missing several easy chances. At last a Carlton player obtained a mark a little to the right of goal, and, to all appearances, put it fairly through the posts, but the goal umpire didn't think so, so the visiting tean had to "grin and bear it." McGill was badly injured, but he played the following week. R. Amess, L. Bracken, W. Bracken, Coulthard, Dedman, Dismorr, Donovan, Gardiner, Goer, Henry, A. Kennedy, McGill, McMichael, Mathieson, Murphy, Nudd, J. Robertson, G. Robertson, Turnbull, and Williamson. Players mentioned; (15) Gardiner, J. Robertson, Murphy, Henry, L. Bracken, Donovan, Guy, McMichael, G. Robertson, Amess, Coulthard, Nudd, Goer, Kennedy, McGill. Carlton Reserves played Melbourne at Melbourne. Amess, Bell, Brooks, Brooks, Drake, Knowles, Long, Monie, Mure, Mure (Muirs), McGibbon, Nathan, Petherick, Robin, Rogers, Sutherland, Spencer, Smith, Todd, Vale (Capt. ), Voake, Williams, Walters, Wheat. Albert Park, Played 4 matches Points 8. Carlton, Played 3 matches Points 4. Carlton Imperial, Played 2 matches Points 2. East Melbourne, Played 4 matches points 3. Melbourne, Played 3 matches Points 2. St. Kilda, Played 4 matches Points 0. "A general meeting of the Albert Park Football Club was held on Thursday evening, to take into consideration a request made by the Carlton Club to have the return match played on the Carlton ground instead of at Emerald-hill, the original fixture. The idea was to obtain money enough by charging for admission, to enable the Carlton Club to take advantage of the season and plough up the ground. So as not to disappoint the Hillites of their anticipated enjoyment, the Carlton secretary expressed his willingness to play a third match at the Hill. After Mr. Power had expressed his views to the meeting, it was proposed by Mr. Furhop, seconded by Mr. McLean, and carried - That the Albert Park regret their inability to comply with the request. The ostensible reason being the disappointment it would occasion to the inhabitants of Emerald-hill." Carlton won the toss and kicked to the eastern goal with a slight wind. Neither side was strongly represented. The Reds played well and they scored the second goal of the game, which got the Blues up and going. R. Amess, A. Amess, L. Bracken, W. Bracken, Dedman, Dismorr, Donovan, Gardiner, Goer, Henry, Kennedy, McGill, McMichael, Matheson, Murphy, Nudd, J. Robertson, G. Robertson, Turnbull, and Williamson. Players mentioned; (10) Murphy, Turnbull, McGill, Henry, Dedman, Goer, Oliver, Coulthard, Gardiner, Nudd. Carlton Reserves (17) played Excelsior in Royal Park at 3pm. Amess, Bell, Brooks, Brooks, Knowles, Long, Moonie, Mure, Mure, (Muir?) McGibbon, Nathan, Petherick, Robin, Rogers, Sutherland, Spencer, Smith, Todd, Vail (Capt. ), Voake, Walters, Wheat. Only ten Carlton players showed up and seven substitutes, some from the opposition had to be selected. Players mentioned; Vale/Vail (Capt. ), Williams, Amess, Petherick, Long. Carlton played Albert Park-North Melbourne at Albert Park. 7000-8000 people watched an even display of football, crowds as usual rushed onto the field towards the end of the game. L. Bracken had a goal disallowed. His sixty yard kick went as straight as an arrow through the centre of the goals, but the goal umpire said that the goal post had been interfered with as the ball went through. Mr. J. Green of Elgin Street offered a trophy for the best Carlton player in this match. R. Robertson, G. Bowen, and J. Macgibbon were appointed to be the adjudicators. It was decided that all the players had played so well that one individual could not be singled out. The Blues played the second half "with skill, vigour, resolution, they have not shown this season; marking well, kicking well, and keeping their places to a man." "Kendall playing a grand game back, and being well supported by Guy, Gardiner and Nudd." L. Bracken, W. Bracken, Coulthard, Dedman, Donovan, Gardiner, Goer, Henry, Kennedy, Kendall, McGill, McMichael, Matheson, Murphy, Nudd, Newing, Oliver, J. Robertson, G. Robertson, Turnbull. Players mentioned; (19) Matheson, Henry, G. Robertson, Dedman, Amess, Gardiner, McGill, Coulthard, Goer, Kendall, W. Bracken, McMichael, Bernard Murphy, J. Robertson, Guy, Turnbull, Nudd, L. Bracken, Kennedy. Carlton Second twenty played Comet at Darling Dardens. The Madeline Street ground is nearing playing condition, the ground having been throughly levelled and rolled. A picket fence surrounding the playing area is nearly completed and all other work is well advanced. After the end of the month (September) the surface will be ploughed and English grasses sown. All other clubs with the exception of Albert Park, have supported Carlton's efforts in advancing the game and have offered to play matches on the new ground. Carlton played Melbourne at the Madeline Street ground. Madeline Street, (an extension of Swanston Street), was later renamed Swanston Street. This ground was part of the Melbourne University campus, north of the Medical School, and is where Newman College now stands. This was first game to played on the Blues' new home ground. Picnic Reserve, Madeline Street, Carlton, has undergone considerable development with levelling, rolling and the addition of a movable picket fence. A pavilion is being built, and before next season a mound will be contructed around the ground, so everyone will be able to view the game. The playing surface measures 200 yards by 140 yards, (183m x 128m) with the goals running north-south. Carlton has spent £250 ($500), and after costs are recouped, any extra money made will be donated to the Melbourne Hospital. The Age says the crowd was between 5,000 and 6,000. Entrance to the ground is via Madeline Street, and cabs run every few minutes from Swanston Street. The game was delayed and commenced at 3.30pm. The Australasian reporter said "I could see every move in it, while the players uninterrupted by the throng, pursued the game under circumstances most favourable, and unparalleled in the history of the colony." The untiring Carlton secretary (T. P. Power) is to be congratulated for the transformation of the ground. Melbourne had the best of the play in the first half, but the Blues came back in the second with two goals to the elder of the two Bracken brothers. Mr. John Green of Elgin Street will present a trophy to the Carlton player who "exhibits the best all round play during the game" R. Robertson, G. Bowen, and J. Macgibbon will judge the best player. Amess, L. Bracken, W. Bracken, Coulthard, Dedman, Donovan, Gardiner, Goer, Henry, Kennedy, Kendall, McGill, McMichael, McSweeny, Matheson, Murphy, Nudd, J. Robertson, G. Robertson, and Turnbull. Players mentioned; (20) Amess, L. Bracken, W. Bracken, Coulthard, Dedman, Donovan, Gardiner, Goer, Henry, Kennedy, Matheson, McGill, McMichael, McSweeny, Murphy, Nudd, G. Robertson, J. Robertson, Turnbull, Williamson. The new football ground on the Picnic-reserve, Madeline street, was last Saturday afternoon the scene of the third match this year between the two leading clubs of the colony - Melbourne and Carlton. The surface has been well-levelled all over at no considerable expense. There were so many holes to be filled up and hillocks to be cut down that it was necessary for a time to have no less than fourteen men engaged on that part of the work in order to have the ground ready for last Saturday's match. Another great improvement was the enclosure of playing ground by a really good and substantial movable picket fence, strong enough to any crowd off the playing space. The advantage of the fence was strikingly apparent during Saturday afternoons play, the combatants having no necessity to request the spectators to stand back and keep clear of the ground, but being left to exercise their skill and ability on the game only. The length of the enclosed space for the players was nearly 250 yards by 120 yards. The Carlton Club deserve every credit for their enterprise in improving the ground. The cost hitherto has been £250, and during the coming spring the ground will be laid down with English grasses, so that next winter it will be perfect for football purposes. Owing to the recent levelling and filling-up, it was rather soft and inconvenient in some parts of Saturday last for the players, but it is expected that in a week or two the altered parts will have become thoroughly solidified. The club of course expected, when they determined on the scheme of improvement, to refund themselves in time for their outlay by making a small charge for admission to the ground when important matches were to be played, and the charge on Saturday last was 6d. The public of Melbourne never seem to object to pay a small fee to witness a good game of either cricket or football, as they know it will laid out on the grounds, and on Saturday afternoon they turned up well. The amount taken for admission was about £109, and the club hope before the end of the season to recoup themselves for what they have spent. If there should be any surplus of receipts over the expenditure, it will given the Melbourne charities. The match of Saturday afternoon was worthy of the opening of such ground, the play being lively throughout the whole of the time, and pleasant to witness. The Melbournites were captained by Sillett, while Gardiner commanded the Carlton men, and Mr. H. Budd acted as central umpire. 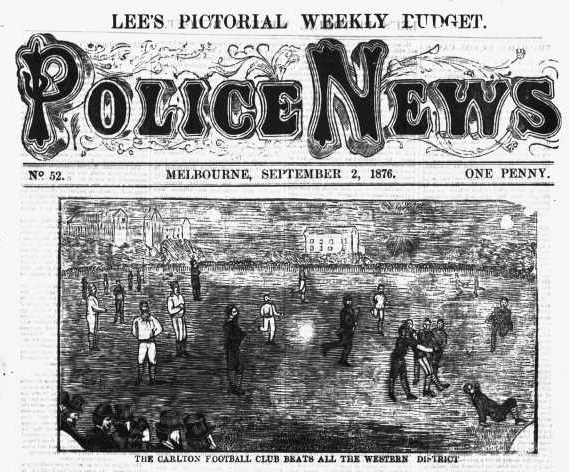 At the commencement of play, the Melbournites, who had to kick up the gently-rising ground to the Carlton goal, soon rushed the ball forward, and by good tactics got it into the hands of Nicholas, who kicked it between the posts, thus securing the first goal for Melbourne in about five minutes from starting time. After the ball was sent off again, the visiting team kept very busy, McKie, Longden, Nicholas, Bride, McDonald, and indeed most of the Melbourne side, be so very smart that the ball was kept constantly towards the Carlton goal in a manner unaccountable to those who know how well Carlton generally played. In a minute or two after the goal was secured Longden got a mark about 70 yards from goal, and kicked the ball well, but it just went outside the posts. Several other marks were obtained by different Melbourne men, but they were too far off to kick the ball through, until, principally through Bride playing well up to James Bennie, the latter got hold of the ball, and turning round quickly, kicked the second goal for his side, not more than a quarter of an hour having elapsed since play began. The Carlton men up to this time seemed to be quite overmatched, but they were evidently not daunted, as they began to be much more effective in their tactics, and when half time was called seemed to quite equal their opponents. After the rest at half-time the Carltonites, who now had to kick up the ground, went off with just as much superiority to them at the commencement of the game. They got the ball towards the Melbourne end at once, and had two chances of goals in five minutes. When play had been going on for only seven minutes Bracken had a mark pretty close to the goal, and kicked the ball successfully through, amid large cheers from the Carlton spectators. It was not much longer before Bracken, who has a great reputation as a straight kicker, got another mark near goal, and again kicked the ball through, amidst tremendous cheers from the spectators, the scoring been then equal with Carlton undoubtedly playing the best. From that time out, however, no alteration was made in the state of the score, as Melbourne men seemed to be thoroughly roused, and played up well to each other, thus preventing their opponents from making a winning goal. Goldsmith, McDonald, the two Bennies and Nicholas, were especially active for Melbourne during the latter part of the game, and it was difficult to say which of the Carlton men were most useful, nearly all of them appearing to be splendid runners, and well able to carry the ball forward whenever the chance presented itself. Amongst the players on that side, however, who deserve notice may be mentioned Gardiner, Bracken, Murphy, Amess, and Nudd. The conclusion of this match was a draw, two goals being credited to each side, and for this season the clubs are therefore equal, Carlton already won a match and Melbourne one. The conquering match of the year has, therefore, yet to be played between them. The Carlton Football Club annual concert and ball held in the Carlton Orderly-room, Grattan Street. The principal performers were Madame Pett, Messers. Dedman, McLure, Shanahan, Kennedy, and Walsh. An address written for occasion, (dwelling on the expliots of the first twenty of the club), was well deliverd by Mr. E. Finn. Dancing commenced at 11pm and continued until 3.30am. A wood-cut engraving of the August 26 match at Madeline Street, showing what appears to be a curved fence. Carlton played a Western District Combined team at Madeline Street. Players from Ararat, Casterton, Coleraine, Koriot and Hamilton made up the team. The team was met at Spencer Street Station by several members of the Carlton Football Club and entertained at the Carlton Club Hotel. The players had averaged a round trip of 400 miles, all to play two hours of football! A crowd between 2000-3000 attended. The Argus said, "The action taken by the Carlton Football Club in improving the Picnic-reserve, Madeline-street, has been warmly approved by the lovers of the sport who have seen the games played there on the last two Saturdays. A free uninterrupted view of the game is afforded everyone, and there is no jostling or rowdy pushing from the crowd narrowing the playing space, and bringing about roughness." Carlton lost the toss and Gardiner kicked off to the northern goal. Dedman scored the first goal within two minutes, then quickly followed it with two more. He kicked another before half time. Bracken missed several easy chances in the first half. The match was played in such good spirits that an umpire was almost unnecessary. Players from both teams returned to the Carlton Club Hotel for a pleasant evening. There is talk that this match may become an annual event. R. Amess, L. Bracken, W. Bracken, G. Coulthard, W. Dedman, Donovan, J. Gardiner, Goer, Henry, Kendall, A. Kennedy, McGill, McMichael, McSweeny, Matheson, Murphy, Newing, Nudd, Jas. Robertson and Turnbull. Goals; Dedman 5, Coulthard 1. Players mentioned; (15) Dedman, Goer, L. Bracken, Nudd, Amess, Henry, McMichael, McGill, Coulthard, Gardiner, McSweeny, Guy, Kennedy, J. Robertson, Murphy. The Blues only once were able to get the ball into their forward line. Amess, Bell, Brooks, Brooks, Knowles, Killigrew, Long, McGibbons, Muir, Muir, Monie, Nathan, Petherick, Robin, Rogers, Sutherland, Smith, Spencer, Todd, Vail, Voake, F. Williams, Wheat, Waugh, Walters. Albert Park won 8 - 0. St.Kilda were missing some players, and Carlton had to rely on it's emergencies. The Saints won the toss, and kicked with the wind. Dedman clearly kicked a goal fair between the sticks and at a few feet below the flags on the top of the posts. The goal umpire said "No Goal!" Little was said at the time, but the unfairness of the decision was freely criticised at half time. The goal umpire then changed his decision to a goal! Amess, L. Bracken, Coulthard, Dedman, Donovan, Gardiner, Goer, Henry, Kendall, Kennedy, McGill, McMichael, McSweeny, Matheson, Murphy, Nudd, J. Robertson, G. Robertson, Turnbull, Williamson. Goals; Dedman 2, L. Bracken 2. Players mentioned; (11 Coulthard, Todd, Henry, McGill, Murphy, R. Amess, L. Bracken, Dedman, Gardiner, Guy, Nudd. Carlton Second Twenty played Carlton Imperial in Royal Park. Carlton played West Melbourne (25) on the Madeline Street ground. The Blues had to find six substitutes to make up the twenty. Carlton won the toss and kicked with the wind, a small gale, to the northern goal. R. Amess, L. Bracken, Coulthard, Dedman, Gardiner, Goer, Henry, Kendall, Kennedy, McGill, McMichael, McSweeny, Mathewson, Murphy, Newing, Nudd, G. Robertson, J. Robertson, Turnbull, Todd. Players mentioned; (14) Coulthard, Amess, Bracken, Goer, McGill, Nudd, Dedman, Henry, Gardiner, Guy, Todd, Boyle, Turnbull Matheson/Mathewson? Carlton played the Barwon Football Club at Madeline Street. Barwon were the holders of the Western District Challenge Cup and had recently beaten both Geelong and Ballarat. The Geelong Advertiser in it's match report said "the Carlton Club by some means took on young Gunn, the best ruckman from the East Melbourne team." Barwon won the toss and kicked to the southern end goal. Brilliant runs by Henry resulted in his two first half goals. Coulthard took the ball the whole length of the ground. The Barwon team was entertained by Carlton after the match. R. Amess, L. Bracken, Coulthard, Dedman, J. Gardiner (Capt), Goer, Henry, Kendall, Kennedy, Mathieson, McMichael, McGill, Murphy, Newing, Nudd, J. Robertson, G. Robertson, Todd, Turnbull and Williamson. Half time 10 minutes duration. Goals; J. Henry 2, McGill 1. Players mentioned; (13) Henry, McGill, Mathieson, Coulthard, McMichael, Goer, Bracken, Gardiner, J. Robertson, Nudd, Murphy, Dedman, Amess. Carlton Reserves played Victoria United at Royal Park. Amos, Bell, Brookes, Brookes, Knowles, Killegrew, Long, Muir, Muir, Monie, McGibbon, Nathan, Petherick, Robin, Rogers, Spencer, Smith, Sutherland, Todd, Vale, Voake, Williams, Weate, Walters. Hospital Saturday Charity Match, six pence admission. Improvements including the ploughing of the ground will be held over until next week. Both teams on level terms and this game will be the season decider. An umpiring mistake possibly cost the Blues from winning four premierships in a row. A charge for admission and the entire proceeds of £115 to be handed over to charity. Nudd while going for a mark was pushed in the back, Baker of Melbourne took the ball overhead, the field umpire shouted "No Mark" and before he had time to pay a free kick to Nudd, Baker played on and put through for a goal which the goal umpire paid. The Carlton players clamoured round the field umpire to pay the free and thereby annulling the goal. The umpire somewhat confused and upset at the language, then left the ground in disgust. Another umpire was found and the game continued. 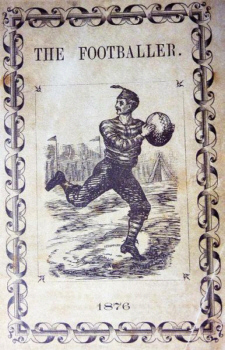 "...if he had not lost his head and temper, and left the ground, he would have given the free kick to Carlton, annulling the goal, as the act of the Melbourne man was manifestly unfair, but he will not say whether the ball was in play or out of play when the goal was kicked, and I suppose Melbourne will go considering the game a win and Carlton a draw." R. Amess, L. Bracken, Coulthard, Dedman, Donovan, Gardiner, Goer, Henry, Kendall, A. Kennedy, McGill, McMichael, Matheson, Murphy, Newing, Nudd, G. Robertson, J. Robertson, Todd, and Turnbull. Players mentioned; (20) Gardiner, McMichael, L. Bracken, Turnbull, Amess, Kennedy, Henry, Nudd, Coulthard, Matheson, McGill, Guy, Robertson, Goer, Kendall, Murphy, Dedman, Donovan, Newing, Todd. Carlton protest against this decision and claim a draw. It appears the Central Umpire, after leaving the playground, admitted to all he met the great injustice he had done Carlton by not annulling Melbourne's first goal, and having left the field without clearing up the dispute determined to do so, but on reflection he altered his mind and seems to have lacked the courage to come forward and clear the doubt up. His silence therefore awards Melbourne with the victory. Because of this disputed win, Melbourne won the 1876 Premiership. Carlton Reserves played Dandenong at Dandenong. The team met at Cavanagh's Hotel Swanston Street at 9am. Brooks, E. Brooks, Bell (Capt. ), Knowles, Villegrew/Killegrew, S. Muir, N. Muir, Nathan, Petherick, Rogers, Sutherland, Vale, Williams, Wheat, Patterson, Dunn, Bracken, Moonie, Browning, Moloney, Gilchrist, Beattie, Hodgkinson. Carlton vs Melbourne: "MANLY SPORTS" By a Vagabond. Observations of the crowd at the September 23 Carlton vs Melbourne match on the Madeline Street ground. Carlton played the Victorian Railways (25) at Royal Park. Neither side had a full complement of players and the numbers were made up with West Melbourne players who were nearby. R. Amess, Coulthard, Dedman, Gardiner, Goer, Henry, Kennedy, McGill, McMichael, Newing, Nudd, G. Robertson, J. Robertson, Todd, Turnbull, Williamson, Brookes, Petherick, Bell, Long. Players mentioned; (10) Gardiner, Coulthard, Dedman, Amess, McGill, Henry, Brookes, Goer, Nudd, McMichael. St. Patricks' Old Collegians played Scotch College. Carlton players taking part were Donovan, Murphy, L. J. Bracken and W. Bracken. Sir, In a letter signed "Melbourne" of the 3rd inst. judge of my surprise through reading these words "The Melbourne Football Club, now the premier" - The writer of these words may master Mill's Political Economy, &c, but I am sure he would never be one of the Melbourne 20 to wrest from the Carlton Club the premiership by fair play. I, along with others, have a notion that to be supreme you should be second to none. But this is not the proud position Melbourne can boast of. This club has been beaten by the Albert-park, East Melbourne, and by Carlton, and still, by this last match with the latter club, still aspires to the premiership. The Australasian mentions during the five months of this football season, only one broken leg and two broken collar bones, plus sprains, have been reported out of approx 3,000 footballers playing the game. Excerpts from Peter Pindar's 1876 season review in The Australasian. "The most notable feature of the past season has been the great spread of the game, which is now throughout the length and breadth of the land, every little country town now boasting it's own football club, whose members persue the sport with the utmost zeal, and many of them no small measure of success." "Considering there are still about £100 owing for the improvements made this speaks well for the liberality of the knights of the leather, more especially when we remember that cricket clubs with their grounds in full swing for years past have never given a brass farthing to charities." "I suppose Melbourne would consider herself hardly treated if denied pride of place, though her performances for the season are far behind those of Carlton, as a glance of the analysis will show; however, accepting the matches with Carlton, who wore the laurel during the three previous years, as the crucial test, and the last match as a win to Melbourne, the latter is fairly entitled to the premiership of the football field for 1876." "The finest results of the season have undoubtebly been achieved by the Carlton club, which has played 20 matches, winning 15, losing 2, and drawing 3, and securing 54 goals (seven of these against Melbourne) the largest number ever obtained by a club here in a season, to 12 on the wrong side. The exodus of a number of it's best men at the commencement of the season considerably weakened the team and though some of the new men - such as McMichael, Henry , Murphy, Coulthard, Mathieson, and Turnbull and the two Brackens - have gone far to make up the loss, I question whether the team all round is quite up to the mark of the previous year, especially as Newing and McGill (who is again in his original form) fell off in their play. Besides the new players I have named, who are every one in good fettle, Gardiner, the captain, Goer, Nudd, and J. Robertson, and occasionally Kendall and Guy, are playing well back. G. Robertson, R. Amess and Todd - the latter two second 20 men who have got into the first 20 form - in the centre, and Kennedy, and now and then Donovan, forward. Dedman is still to the fore in goal-sneaking, having secured no less than 18 goals, one against Melbourne, while L. Bracken has also proved a good man and true in this respect, having got 12 - three against Melbourne; and Henry, Nudd and McGill have contributed their share in 6, 5, and 3 respectively." The loss of stars like Lacey and Wallace, the decline of Blanchard and Macgibbon, and the intended retirement of Guy, Donovan, and Monie, was a severe blow to the old club; but the influx of new blood compensated in a great measure for all of this. 20 matches were played, of which 15 were won, 2 were lost, and 3 drawn, 54 goals were kicked and 12 lost, the best analysis ever shown by a club in a season. The recruits bear off the honors, McMichael, Mathieson, and Coulthard working hard in the ruck. Henry, Murphy, Turnbull and W. Bracken have made excellent forwards, Gardiner (captain) has borne the brunt of many a fierce onslaught back, while Monie, Guy and Kendall (always welcome), have lent occasional assistance in the same position; Goer and Nudd have proved themselves good men and true anywhere; Kennedy, Williamson, and the Robertsons have assisted around the centre and wings with their accustomed ability; McGill (out of form at first) worked hard and did wonders at the finish; Donovan and Newing did not play often, but were always appreciated; Amess and Todd, promoted from the second, were valuable supports; while Dedman and Bracken have proved themselves adepts at goal-sneaking, the former's quick and adroit dodge securing him 18 goals, while the wonderful accuracy of the latter's place kick (something to be seen and admired), obtained him 12, Henry, Nudd, and McGill assisting to swell the score, with 6, 5, and 3, respectively. "Next season will probably usher in a Football Association or Union - a much needed body - that will look after the best interests of the game and the strict keeping of it's rules. In England, Scotland, and Ireland the Association for the furtherance of the "Dribbling," and the Rugby Union for the interest of the "Carrying" game exist; a Rugby Union is also in vogue in Sydney, and they are all found to work admirably. The rules will no doubt be revised, several desirable alterations having been suggested. They however can form the subject of a quiet study during the Summer vaction." The Victorian Football Association was formed for the next season (1877) and it would remain the controlling body for Australian Football in Victoria until eight senior clubs broke away and formed the Victorian Football League in late 1896. Carlton played 20, Won 15 Lost 2 Drawn 3. Goals For, 54. Against, 12. Dedman 18, L. Bracken 12, J. Henry 6, H. Nudd 5, McGill 3, Turnbull 2, Coulthard 2, Dismorr, McMichael, Jas. Robertson, Newing, Williams, E. Brookes. Played 11, Won 5, Lost 5, Drawn 1. Bell 3, Brookes 2, Vail 2, F. Williams 2, J. Spencer, S. Muir, James Toohey, Deeley. Albert Park won the Second Twenty Subscription Cup competition defeating every team they played. The opposition teams failed to score a goal against them! The Carlton Story. Hugh Buggy and Harry Bell. Pages.36,37,38,39,40,259. 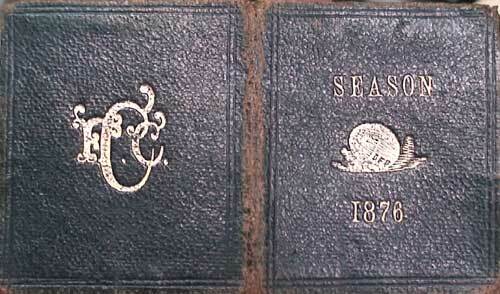 The History of the Carlton Football Club. B. Hansen Pages.31,32,33. North Melbourne Advertiser, 1876 editions. The Telegraph, St. Kilda, Prahran, & South Yarra Guardian, 1876 editions. Contributors to this page: blueycarlton , pblue , Jarusa , molsey and admin . Page last modified on Friday 31 of August, 2018 07:43:58 AEST by blueycarlton. 1986 - Warren Jones article (page 1 of 2) 31/07/86.